"Sweet poems, personal poems, that resonate with the flavor and wistful spirituality of the Jewish people and our long impassioned history. Rick Chess's poems are quietly honest and real, companions for our own sad journeys, at home or abroad, in these sunset days on earth. A book to savor and contemplate, for its depth and wisdom." Norman Fischer, poet, Zen teacher, Jewish Meditation teacher, author of "any would be if" (poems) and "What Is Zen: Plain Talk For A Beginner's Mind"
Richard Chess's third book of poetry is, as Alicia Ostriker says, "Jewish to the bone, and theologically incorrect." Author Robin Becker calls it "playful and erudite, irreverent and prayerful," adding, "Read THIRD TEMPLE for its rich musicality and wise meditations on gender, politics, and the requirements for the moral life." The season is late summer. The cities are Philadelphia and Jerusalem. The wildernesses are desert and mountain. The voices are those of a man and a woman on paths where God and demons are at strife, on public beaches and city streets, in therapists’ offices and synagogues, in the Jersey Pine Barrens and at the Western Wall, at klezmer concerts and supermarkets, on boulevards, and in backyards and beds. Lament, lure, confession, enjoinder, boast, prayer, plea—the poems in Richard Chess’s Chair in the Desert pick up where he left off in Tekiah, his first book. These new poems invite us to rise and tremble in the presence of the new day and to make of our midnight wrestling and restlessness a psalm. 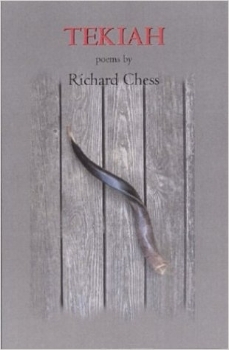 Richard Chess established himself as an important contemporary poet with this first collection, originally published in 1994 by the University of Georgia Press in its Contemporary Poetry Series. This new edition from the University of Tampa Press assures that his profound and memorable poems will continue to be available. With works by over 100 poets, The Bloomsbury Anthology of Contemporary Jewish American Poetry celebrates contemporary writers, born after World War II , who write about Jewish themes. This anthology brings together poets whose writings offer fascinating insight into Jewish cultural and religious topics and Jewish identity.